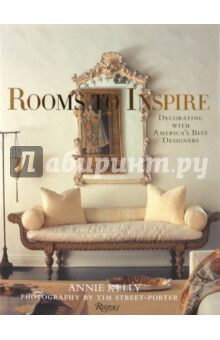 In &quot;Rooms to Inspire&quot; twelve trendsetters bring a fresh point of view to creating interiors for a spectrum of living spaces-from houses to apartments and country retreats. This selective group-some professional decorators and others renowned for their taste making-includes Marian McEvoy, Kelly Wearstler, Muriel Brandolini, Jonathan Adler, and Simon Doonan. They offer their own very personal perspectives and advice using their own homes as examples-many published here for the first time. These intimate and inviting, absolutely non-formulaic interior spaces express the personal style of these highly creative individuals. Today&apos;s designers show how to experiment freely with every detail. This extraordinary sampling features the designers&apos; own homes, ranging stylistically from the theatrical to eclectically modern. Common design issues such as color, balance, and comfort, as well as innovative approaches to kitchens and bathrooms are addressed. The designers also offer their favorite resources. This inspirational guide for professionals and novices encourages us to infuse our living spaces with style and personality. Издание на английском языке.